A dog is a man's best friend. This couldn't be more true! Our dogs are our loyal companions through and through, so why not treat them like it. Your sweet four-legged friend deserves the best of the best. 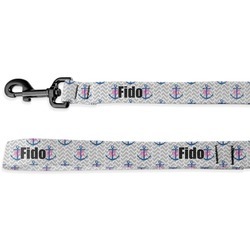 These sturdy personalized dog leashes are the perfect way to make your furry friend shine. It is made of a durable nylon weave to ensure some longevity even while being pulled or tugged by a dog. At the end is a black coated typical dog leash spring clasp made of metal. The leashes come in two sizes of 4ft and 6ft. The 6ft leash comes with a larger clasp, so it is recommended that this leash be used for medium and large dogs, while the 4ft one should be used for small and extra small dogs. Now start personalizing! Your dog's leash will be printed front and back, so that you have double the fun. Add their name or a cute saying with a fun pattern behind it. No matter what, just have fun! If you ever have any questions or concerns, just give us a call. We are always happy to help! Accessorizing your sweet dog has never been easier. Be sure to look through our personalized Pet Accessories section where you will find dog collars, bandanas, treat jars, deluxe dog collars, pet tags and more! You can even coordinate and get everything in the same design!